Connectors are available in solder with pins pre-loaded or crimp. Both versions can be mounted direct to a cable or panel. Crimp pins are offered in a closed or open entry. 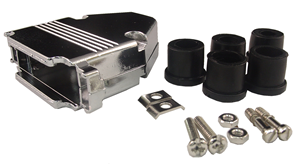 Connector hoods can be ordered in plastic or metal with options such as thumb screws or metric screws.